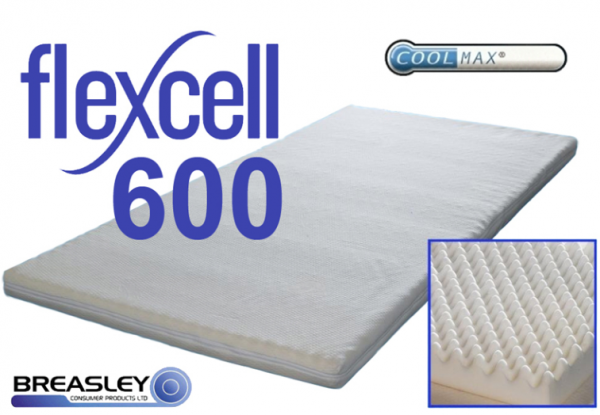 We believe we offer the highest quality mattress at the cheapest price, if you can find a Flexcell memory mattress at a cheaper price with the same specification we will offer a price match. Memory Foam Topper made by Breasley in the UK. Uk's Best seller! A Memory Foam Topper is ideal if you have a mattress in good condition that doesn`t sag and you want the benefits of memory foam. Using the same high quality memory foam 55Kg/m3 as used in all of our memory foam mattresses, why not turn your existing mattress into the most comfortable and supportive sleeping surface available by using our Memory Foam Topper. If your existing mattress is only a few years old and feels too hard, a memory foam topper will transform your bed into the latest sleep surface. Does this memory foam topper get hot? and the memory foam toppers also have a Coolmax temperature regulating cover. Does the Memory Topper have a warranty? Yes it as a full 5 year warranty, not like some companies that work on a sliding percentage scale. Can you wash the cover on the Memory Foam Topper? Yes, as long as you wash them on a 30 degree cycle and do not tumble dry them. What weight can the Memory Foam Topper support? It will be fine up to 18 stones, this is an individual weight not the combined weight of two people. Is it okay to use an electric blanket on a Memory Foam Topper? Is Coolmax® fabric made from polyester fibers? Coolmax® fabrics are designed to move moisture away from the body and enhance fabric drying rate thus, keeping you feeling cool and dry. Coolmax® fabrics deliver performance and comfort through the use of proprietary polyester fibres with unique engineered microchannel cross sections and/or specially engineered two sided, denier gradient fabrics made using Coolmax® qualifiable polyester or nylon yarns, elastane. Is Coolmax® a treated polyester? No, Coolmax® is not a treated polyester. The performance of Coolmax® is inherent in the fibre structure itself, thereby providing consistent performance wash after wash.
What's the difference between Coolmax® fabrics and other polyester fabrics? Coolmax® fabrics are specially designed to provide not only superior moisture management, but also to enhance comfort. The specially-engineered fibres using Coolmax® fabrics provide enhanced breathability (called "air permeability" by the techies) that differentiate Coolmax® from generic polyester fabrics, which use standard round fibres. Air permeability is just one of our key performance tests that fabrics must pass before they can be sold as "Coolmax®". And, remember, that all of the benefits of Coolmax® fabrics are permanently built right into the fibre, requiring no chemical treatments like those other wicking fabrics. Why are Coolmax® fabrics more comfortable? Do covers made from Coolmax® require special care? Covers made with Coolmax® fabrics are machine washable and need to dry naturally; however, fabric softeners and chlorine bleach should not be used. What are the advantages of Coolmax® vs. cotton? Besides its positive effect on maintaining body core temperature, Coolmax® is fast drying, breathable, and resists fading, shrinking and wrinkling.